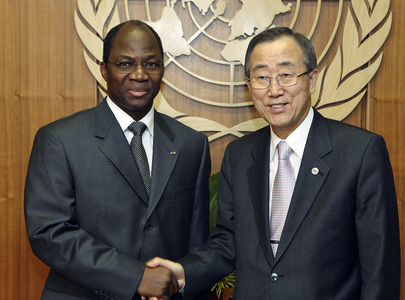 UNITED NATIONS, April 12 -- With complaints mounting of irregularities in the elections in Sudan, UN Secretary General Ban Ki-moon on Monday morning said the voting was proceeding "without serious problems," and that it is up to the Sudanese, and not UN staff, to conduct the elections. This hands-off approach, however, does not seem to extend to the UN staff member who was presented as a Darfur rebel leader willing to negotiate with Omar Al Bashir, while being paid by the UN. Inner City Press asked Mr. Ban about this scandal. 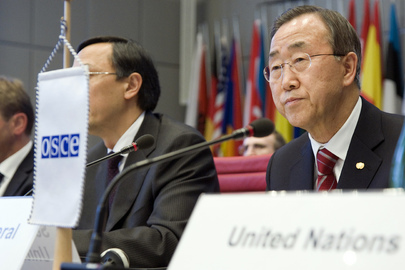 At first Mr. Ban said he did not understand the reference to the credibility of the UN. Then Mr. Ban said, "I will have to talk with our senior advisers on this matter. But as a matter of principle, United Nations staff should discharge their work in accordance with all the rules and regulations. We are not there to engage in any domestic politics and these kinds of things." One of Mr. Ban's senior Darfur interlocutors, Djibrill Bassole, is well aware of Al-Tijani Al-Sissi Ateem's double service: he has been asked about it. But the problem at the UN is a total lack of accountability. The UN's top envoy to the Congo Alan Doss was shown, by his own e-mails, to be engaged in nepotism, urging the UN Development Program to show him "leeway" and give his daughter a job. While Mr. Ban announced an investigation, that was nine months ago. The goal seems to be to delay any conclusion until Doss retires at the end of June, and then to declare the matter moot. How much more so in the case of Al-Tijani Al-Sissi Ateem, who belated left the UN payroll in March 2010. The problem is, his role in the Darfur "peace" process is compromised, as he took UN money while purporting to represent the Fur people. Watch this site. Q: I want to ask on Sudan. There are reports of widespread irregularities in the voting, and the SPLM has asked, even in south Sudan, for a delay, for an extension of the voting for three to seven days, so that ballots can be delivered, stuff like that. I wanted to know what the UN’s assessment is, and also, it has emerged that this pro-Government Darfur rebel leader, Al-Tijani Al-Sissi Ateem, was in fact a paid UN staff member through March 8th of this year, while doing political work openly in Doha, Addis and elsewhere. I am wondering what will you do if you find UN staff rules were broken and the UN’s credibility called into question in this case? SG: First of all, the elections had begun and will continue until the 13th. I am told by our mission in the region that the election has taken place and is continuing without much serious problems in terms of security. People are standing in queues to exercise their right to vote. That is encouraging. As for the detailed way of how this election is being conducted, whether there is fraudulence or irregularities, we’ll have to see and particularly discuss with the National Election Commission and the Sudanese Government. The United Nations has been providing technical assistance and logistical support. It is the Sudanese Government and people who conduct these elections. We will be there to support this. I do not understand what you meant about the credibility of the United Nations staff? 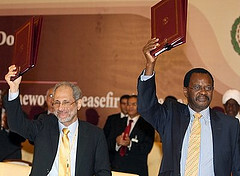 Q: There is a Darfur rebel leader that signed an agreement with the National Congress Party of Omar Al-Bashir, that now it has come out was in fact a paid UN staff member of ECA [Economic Commission for Africa] in Addis Ababa, while he was negotiating with the Government, and purporting to represent people in Darfur. So what I wonder is, is it your understanding that UN staff rules say that you can’t be a political participant in a country’s affairs while you are a UN staff member? SG: I am not aware of this specific case. I will have to talk with our senior advisers on this matter. But as a matter of principle, United Nations staff should discharge their work in accordance with all the rules and regulations. We are not there to engage in any domestic politics and these kinds of things.